I haven’t been to church in a really long time. A very long time. Years. I live in the deep South, which makes this an unusual occurrence. I was raised both Catholic and strict Southern Baptist, with varying degrees of ideas of what made a good Christian. While in college, I settled into Episcopalian faith. It fit me. It didn’t judge me for not being a particularly religious person, but more of a spiritual one. We moved, we had kids and I tried to go. But it just didn’t work. I became disenchanted with people that claimed to be a Christian, but only had harsh judgements for others for things they themselves did. I struggled with knowing that the people that hurt me as a child hid behind the teachings of Christ. I struggled when people told me that God only gave me what I could handle, because that’s not my God. I wondered where I belonged in that equation because I just struggled to understand. I had to stop asking to understand, because I know I will never get the answer that I want. We are all works in progress, though, including myself. And with age comes this hard earned wisdom. This last year I have struggled with the demons from my childhood. As in, I am struggling. I got hours and hours and years and years of help as a teenager/young adult. And I thought I was okay. My therapists warned me that while I might feel okay, once I had children, I might feel differently. I had two children. I did not feel any differently. I thought I was okay. And then last spring, it hit me like a ton of bricks. 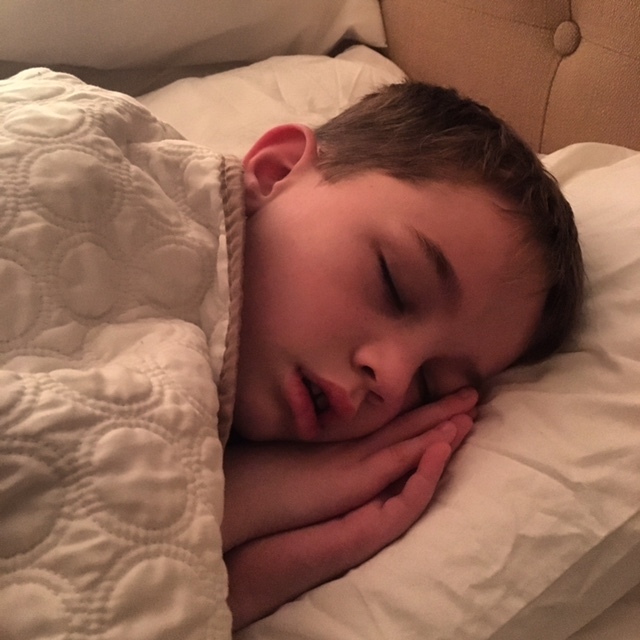 I was tucking my sleeping child in, covering his tiny body up with a blanket staring at his freckles and all of a sudden, I could not breath. No matter how hard I tried, I couldn’t inhale and this giant weight sat on my chest. I was staring at an innocent child the same age that I was when all of the horrific things I worked through happened. The same things that my body is still paying for. The same things that cause me to pause daily. The overwhelming shame, the anger, and the failure to understand flooded back, blindsiding me and no matter how hard I have tried to breathe, it gets harder. I get angrier and sadder at the same time. The more I try to understand, the less I understand how I share the same world and breathe the same air as these repugnant people. I’ve gotten much quieter this year with these new emotions, grasping at the slivers of childhood joy I’m watching unfold in front of me, grieving the childhood I’m watching my children have, but that I’ll never know. They have, in all its glory, the innocent childhood I wanted for them. The more joyous I am about that, the more painful it is that it was stolen from me. I’ve gotten quieter because I can’t hear what the universe is trying to tell me because I’ve been drowning in this external noise of pain. I’ve gotten quieter because I need to hear what is being told to me. Last night, I felt the urge to go to church for Ash Wednesday services. So, I got up today, got ready, and went to church. I sat there, in a back pew, staring at the exquisite ceiling and the light streaming through the stained glass windows and wondered if I should be there. I thought just get quiet enough to hear. In this very moment, be silent and listen. The rector started the sermon by referencing the AA meeting that was going on in the next building. He said he was always amazed how well it worked, but he knew why—- because we bond in our brokenness. That we are not perfect, especially not the strong ones of us, and we all need to know that we are not alone in our struggles. We are taught not to talk about our struggles, especially in the South, you just don’t discuss the hard things. He urged us to talk about the hard things, our brokenness, and in that, we heal together. I started to cry in the back of the church. I’m not alone, and neither are you. My husband, family and closest friends have known I am struggling, but today I am sharing it with you in the hopes that if you need to read this, that you will, and know that it is okay and we are broken together. So you know that even the strongest struggle with being broken. Sometimes, the scars we thought were healed, are really partially still scabbed, and must be healed from the inside out. And that’s okay. Because no matter how much therapy, no matter how much healing has happened, the pain and continuous striving to heal will never end. That, the acceptance of that, the never-ending pain, no matter how much less it will one day be, because it is already so much less than it once was, is the hardest part of this journey. This is the most surprising, almost startling realization to me, that it will never end. Because, I, like you, am a work in progress. This Lenten season, my hope for you is to get quiet and listen. Take whatever your higher being/God/universe is trying to tell you and LISTEN UP. I hope that you acknowledge your brokenness and not regress with defeat. I hope your scabs heal and turn into hard earned scars. Lessons abound when you are humble enough to see them. I believe learning to listen us the hardest step. It asks us to relinquish control (again), making us feel vulnerable. I’m so happy you’re able to do that finally. The Evil One will do his best to discourage you. Show him who’s boss. I love this. You are brave by acknowledging something being shown to you. And even braver to act on it and go. I went back to church for the first time in a while too. It is good to give HIM a chance to speak to us. Even if we are filled with all the doubt of this world. Thanks for reminding me to hush, listen and look for the good. Beautiful piece. Having a broken relationship with a parent, I completely identify with the thoughts on how it can be simultaneously joyous to see your children not have to deal with your childhood scars, but at the same time feel the pain because of what you can never get back. Thank you for sharing. I think you captured the meaning of the Lenten season perfectly. Love this! It’s true, so many of us try to hide our brokenness when really, if we bear each others burdens our shared brokenness can bring healing. Thanks for your vulnerability in this beautiful piece. Thank you. I needed this today to know it’s okay to be broken and that I am not alone in my struggle. Thank you for your courage and for sharing.